- One, two, three or six Degrees of Freedom. - Several available dimensions. Standard payloads up to 30 ton. Standard frequency range up to 100 Hz. 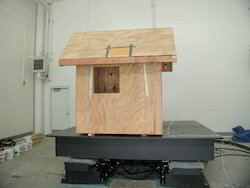 Mineral Technologies designs and manufactures the MD Gemini range of Shaking Tables. MD Gemini Shaking Tables have been specifically designed to produce a gold concentrate that can be directly smelted to bullion. The new ‘Mk2’ features a direct, fixed speed drive system and can be operated in batch or continuous mode. 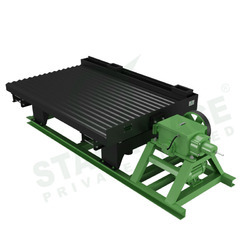 Lower pay load shake table is a custom designed shake table with high Amplitude and low frequency the amplitude can be adjusted from 0 to 25mm and the frequency can be varied from 0 to 3Hz. The amplitude can be adjusted through the guide screw which is connected to cam block and through the crank shaft mechanism the plate is moved in the horizontal direction.